Is this common back in the States now, or is this marketing trick being tested here in Asia? You can’t tell from this shot, but that screen at the top right is displaying nonstop Coca-Cola advertising. Yeah… somehow I don’t buy it. It is sort of a novelty the first time you see it, but after that, you ignore it as usual. I’ve never seen anyone watching the screens. Seems like an awfully big investment, considering I am seeing these things all over Shanghai now. Does that coke machine LCD say “LG” on it? It looks like the logo from the photo … funny you mention that the machine has an LCD because there was another example of that in Mack 10’s hometown in SoCal. Down in Inglewood Los Angeles over the weekend, I pulled into a Shell station because the V-Power 91 gas was $2.44 a gallon. When I looked at the gas pump, it had a large LCD displaying the latest news headlines and random consumer ads such as cola products – the LCD also had sound so it was like a morning dose of TV at the pump. … oh, and the coke machine with an LCD has about the same effect as an LCD in the subway or an LCD posted above the waiting line for the subway or an LCD on a gas pump or an LCD in front of a broadcasters desk on ESPN: The awareness, acceptance and mainstream accessible price-point of LCD’s. I dunno about the States, but these suckers are all over the Tokyo region now. Of course, considering there is a vending machine for every SQUARE METER of space in Japan, be it next to the train station or just in the middle of a block of houses (with no other commercial businesses in the vicinity), the ones with the screens, though numerous, are but perhaps 5%… But the thing is, while the screen is but a novelty on a free standing machine, when you see the rows of 15 or 50 machines like in Japan, perhaps your subconscious is more likely to buy from the fancy-pants machine with the groovy screen, yeah ? Anyway, I am disappointed to see the mechanism for the machines over there — those little plastic bumps. I was screwed over sooo many times by such a horribly designed dispensing mechanism in the USA, that I would never ever consider buying anything from such machines again. As for Japan, the inside of the machine is concealed, but I’m pretty sure it isn’t that retarded sort. Anyway if they are so advanced to put a screen, for the love of god why can’t they detect if you actually received the product, and give you a refund when it jams ? THATS a feature that would give a machine 1st priority for purchases for me. its the result of the american cultural imperialism. 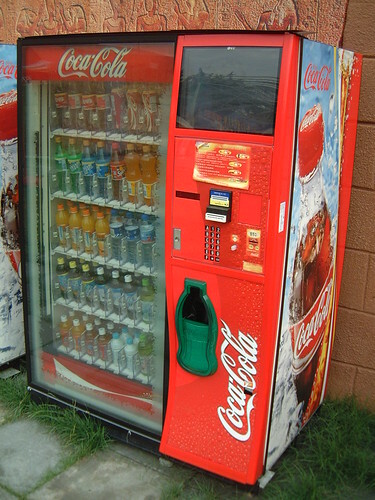 Are these machines owned by Coca-Cola (or whoever), or are they owned by private vendors? I remember when I was a kid back in the States, they had put little video games on the Coke machinese. Buy a can of Coke and play a little version of Space Invaders on the old green and black LCD screens. That didn’t last long, though, because if there was somebody playing the game, the next person had to wait for Game Over to buy his Coke. They have video screens at many bank machines now. The goal there isn’t to induce people to withdraw/deposit money so much as providing a distraction while the machine processes, and engage in some corporate sloganeering to a captive audience. Note that the bottle dispenser is below the screen rather than gravity driven and below the bottles. And why the hell do they NEVER have “Diet Coke” in these machines? I remember being the sheer excitement of seeing those TV screens in lifts for the first time…. in Shanghai, no less. Now Coke machines? You guys think you’re pretty fancy, huh?! These machines in the street surprised me the first time I was in Shanghai. Maybe that’s not so bad considering the visual pollution. Nothing like that that I have seen in the States yet. Be interesting if they had instructional videos on the vending machines, in case someone is unfamiliar with the product. Japan has a greater variety of vending machine content that other places that I have heard of.